In You've Got Mail, Nora Ephron used the magic of the written word to unite would-be lovers Tom Hanks and Meg Ryan in her clever hybrid of screwball comedy and Jane Austen's Pride and Prejudice which resulted in the delightful 1998 box office smash. Cinematically speaking, Mail’s basic pen pal premise has a rich screen history with roots tracing back as far as Ernst Lubitsch’s Shop Around the Corner (as well as its musical remake In the Good Old Summertime). Both Hollywood Golden Age pictures reinforced Austen’s theory that sometimes the key to uncovering a person’s truest self can be found in print (as Elizabeth Bennet’s turning point with Darcy occurs only after he writes her a revealing letter). But books being books and films being films, Hollywood diluted the medicinal moral of the story with a heaping spoonful of sugar-sweet, sophisticated comedy. For shy strangers or those who live in different locations – whether in the same apartment on different days via the conceptually similar Night We Never Met or on opposite sides of the country in Ephron’s script for her classy Affair to Remember send-up Sleepless in Seattle, the centuries old practice of wooing with words is often revisited on the silver screen. 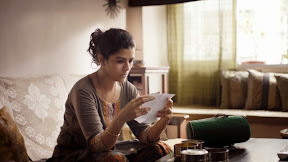 And the premise is given a modern makeover in the internationally successful, inventive Indian crossover comedic hit The Lunchbox which cleverly infuses the romantic timbre of the film with another favorite method of movie courtship by harking back to the age old (maternal) adage that the best way to a man’s heart is through his stomach. 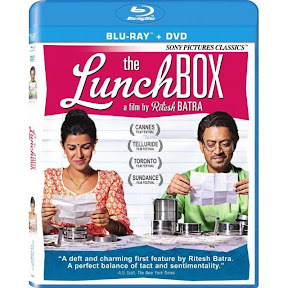 Therefore, an unlikely connection between two lonely hearts is forged due to a mistaken lunchbox delivery that seduces both the heart and head in this Cannes Film Festival charmer which garnered the critic’s prize for the film from first time feature filmmaker (and scripter) Ritesh Batra. And just like his work epitomizes the accidental one-in-a-million “meeting” of likeminded souls that fall in love from afar (following a one-in-a-million mix-up that finds a lunch prepared with love by a neglected young wife falling into the hands of a hardworking, soon-to-be retired widower), the idea for The Lunchbox occurred to the filmmaker by a similar accident after he began researching his intended topic. Looking into the legendarily efficient and globally renowned intricate lunchbox delivery system of Mumbai’s world famous “dabbawallas” for a proposed documentary, Batra soon became more intrigued by the prospect of following the thread of a hypothetical (and incredibly rare) occurrence of what would happen if one particular lunch was delivered to the wrong recipient from an unsuspecting housewife named Ila (Nimrat Kaur). Batra’s first foray into feature filmmaking after a career begun helming shorts, The Lunchbox has the same fresh urgency and efficiency of not only the dabbawalla system but also the skills Batra acquired in his extensive background writing and directing succinct works. Filling his production with an impressive array of subplots that are all thoroughly explored so that supporting characters are as fascinating as our two leads (regardless of whether or not they even have screen time), when Lunchbox ended I found myself marveling over his rich, multi-layered tapestry and the way that it had so completely transcended its deceptively simple premise. Throughout I sat transfixed by the curious inner lives of Ila’s upstairs neighbor – the advice dispensing “Auntie” who shares recipes and worries about her young friend's love life as if it were a televised soap opera she watches to distract herself from the heartbreak in her own life taking care of an invalid husband – as well as the ambitious new employee hired to replace our initially grumpy lead (Irrfan Khan). 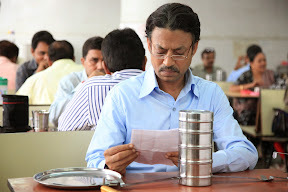 Fighting against what could’ve been (in lesser hands) a stereotypical character that just served to drive home comedic payoffs becomes instead in Batra’s Lunchbox nearly as important to the central storyline as the overall love story as the young employee (Nawazuddin Siddiqui) has a profound effect on the elder workaholic’s life. A warm hug of a movie that’s filled with a generosity of spirit and a refreshing appreciation for the complex highs and lows of life, Batra’s humanistic love story is as heady as it is level-headed. Though it will undoubtedly appeal to those that enjoyed Amelie, Eat Drink Man Woman and Chocolat, The Lunchbox avoids the temptation to give into established formulas to instead follow its own recipe. 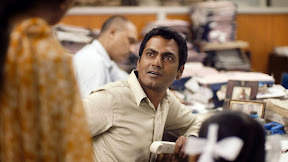 Staying true to the characters he'd created, as the bond between the two strangers grows that much stronger through an ongoing exchange of confessional notes, the filmmaker respects not only the fictional world of Lunchbox’s Mumbai but the intelligence of his viewers who know that you can’t run away to some magical land of “happily ever after” where everything works out in the end. Thus, Batra dares to end his film a good one to two scenes earlier than many of his contemporaries would’ve (and probably will) if it’s remade in America. An earnest and affable look at the positive impact we can have on each other and the way that now more than ever – in a contemporary life where people stare at their phone rather than those in the same room with them – how vital it is to connect with others, The Lunchbox is a beautiful, sincere ode to old-fashioned conversation in a brave new, technologically advancing world. A wonderful reminder of the power of words and how (to the right person at the right time) all of our shared “nothings” have the potential to equal a profound “something,” Batra’s work stands as a shared celebration of a life where we’re all in this together, no matter what country we’re in – even if we accidentally eat someone else’s food once in awhile.